New York Times produces 350 pieces of content per day. Huffington Post produces 1,200 pieces of editorial content and 400 blog posts per day. Slate produces 60 pieces of editorial content per day. Business Insider produces 300 pieces of editorial content per day. You know what all of these blogs have in common? They all carry quotes from industry experts. Why couldn't you be one of the experts they cite? Think about it. You might not think of yourself as an expert, but does your resume argue otherwise? Have you been serving a niche or operating at a certain level, for so long? Why isn't your opinion as valuable as the next person? If you are cited in the news, it reflects very well on your personal brand, reputation and positions you as a go-to person in your field. Can you imagine the eyebrows raising when a recruiter or hiring manager researches your background and finds you in one or several news outlets? Speaking from personal experience, it can be most beneficial when it comes time to negotiate your compensation package. 1. 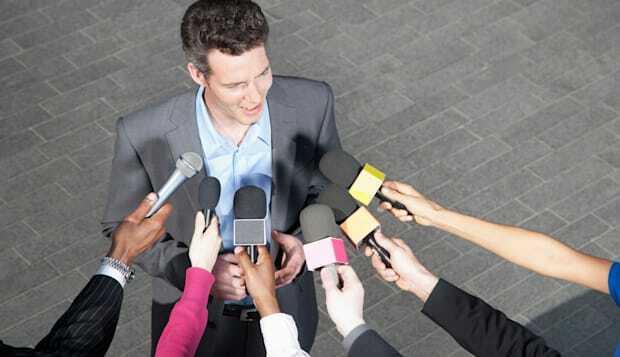 Create a list of outlets/reporters who would most likely want to interview or quote you. 2. Pitch yourself to reporters as someone worthy of being interviewed and/or quoted. 3. Seek opportunities where your expertise would be appreciated and/or solicited. Muck Rack. Subscribe to a service like Muck Rack, which is a comprehensive database of journalists and the publications where they work. It also cites the reporters' social profile and the stories they typically cover. It isn't free or cheap but, if you are dissatisfied, they do offer a money back guarantee. Google. Of course, you can always do a web search for reporters cited in the news themselves. Click here for an example of how I would find a reporter who might be connected with the cloud computing industry. Subject: (1) I've been right about X for years, but nobody wanted to listen to me... until now. (2) No one saw X situation coming, but I did. I saw it years ago, (3) blogged about it constantly on my blog – "Political Joe" and petitioned the President on CNN to take a sterner position during his last presidential run. People laughed at me, but I was right. (4) Do you need a quote from a credible source about this? If so, let's connect. 2 - First sentence is intended to grab their attention. 3 - Second sentence lays out my experience and reasons for the reporter to listen to me further. 4 - My pitch in a nutshell. Third, seek timely opportunities to share your knowledge. Now you may be thinking that, "Jim, I am not a political analyst. How does that apply to me?" To which I would reply, keep an ear out for the "hot news" equivalent. If your background is telecom, what could you add to a story about the new iPhone? If you are an administrative assistant, how could you add to a story on "7 Ways an Admin Should Manage a President" the day after a new president is elected? Get me? Keep in mind that reporters are extremely busy people and may not jump on every idea you pitch. Be patient and be willing to assist them on other stories if asked. A good relationship with the press could pay off over time.